Plastic cutting boards are extremely popular today, used in commercial and home kitchens alike. Plastic can come in any color, allowing kitchens to colour-code chopping boards to prevent cross-contamination. They are dishwasher-safe making for an easier clean-up, and are less expensive than wood. However, there are good and bad plastics. Slick materials, like acrylic, dull the knife. It’s best to stick to polyethylene or polypropylene. Once a plastic cutting board is knife-scarred or has a broken surface, it becomes exceptionally difficult to clean even when subjected to vigorous means, like bleach treatment. 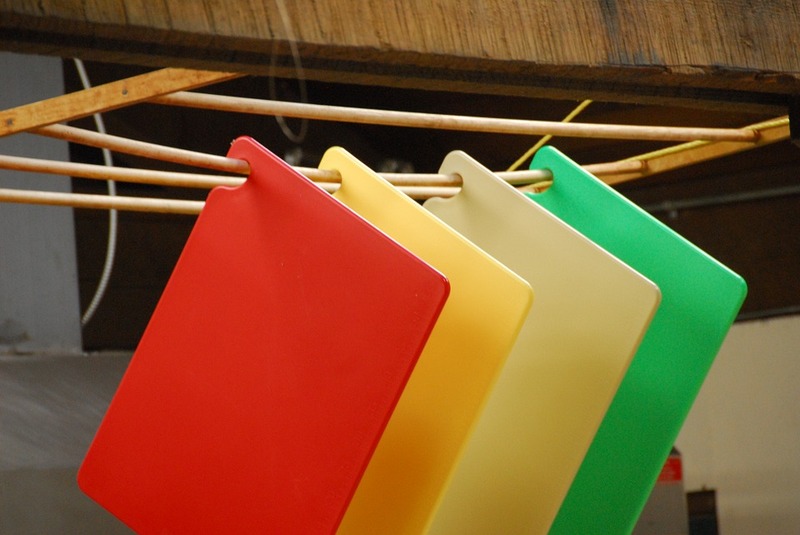 The risk of contamination is especially great with older plastic chopping boards. Riddled with dents, these old boards create an ideal area to harbor bacteria. Often, leftover germs will make people feel ill after eating a meal prepared on a worn chopping board. Grosser still, mould can grow under the surface of the board. The mould will manifest itself as staining, but may go unnoticed (tip: surface stains can be removed with lemon juice). If you own a battle-worn plastic cutting board, it’s best to bin it. However, plastic chopping boards in good condition are great to use when preparing raw meat. Unlike wood, plastic can safely be put into the dishwasher. The intense cleaning and high temperature washing will kill any traces of bacteria. A controversial study from 1993 carried out by the University of Wisconsin found that bacteria multiplies more readily on plastic as opposed to wood surfaces. Chopping boards of four types of plastic and seven kinds of wood were left unwashed overnight. Each board had bacteria on the surface. Bacteria did not survive on the wood boards, but thrived and multiplied on plastic boards. Unlike plastic which tends to dull knife blades, wood chopping boards have less wear on knives. As the material itself is hardier, there is less of a chance of severe denting or scratching. Though one of the great things about wood is that even if the surface is nicked or scratched, the top level of the board can be removed with a refinisher. This treatment renders a damaged board good as new. On the other hand, if a plastic board becomes knife-scarred, it must be thrown out. Therefore, wood is long-lasting and can be in use for years. Additionally, wood is heat resistant, allowing cooks to place hot pots and pans on its surface. Wood chopping boards do come with a drawback: they require regular conditioning. Food-grade mineral oil must be applied to the surface monthly (or as often as is remembered) to keep the board looking lustrous. Actually choosing a wooden board can be nerve-wracking due to the vast number of choices. The process requires quite a bit of research. Check out this guide if you’re interested. Wood supposedly halts the growth of bacteria on its surface. In the study mentioned above, 99.9% of bacteria on wooden surfaces died within three minutes of contamination. Wood does not suffer bacteria for long and this property persists regardless of age. Some argue that bacteria are simply absorbed into the wood, but this has been a source of debate for over a decade. It is true that wood chopping boards absorb things, such as scents, oils and liquids. They are more susceptible to staining which is why people tend to use them for prepping vegetables or ready-to-eat foods. 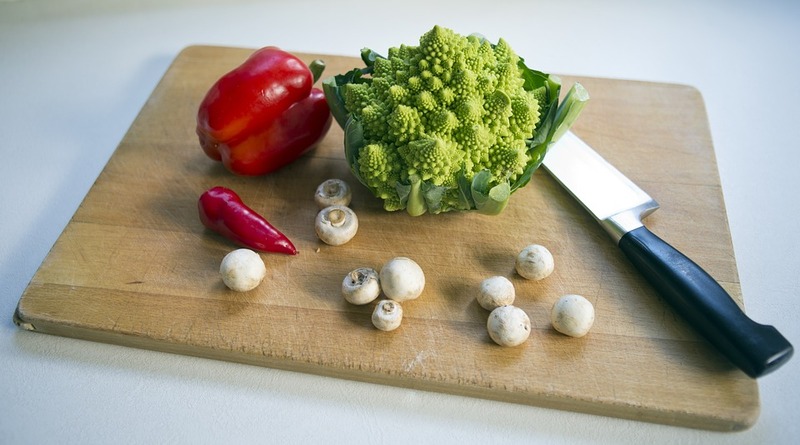 To keep chopping boards free of bacteria, dry them with a disposable towel as soon as they’ve been washed. This minimizes the time in which bacteria can multiply. Don’t stack damp boards together as this creates a breeding ground. Be sure to wash chopping boards with hot water and soap. It’s okay to use the same chopping board for meat and veggies as long as the board has been washed. Do not subject wooden chopping boards to excessive water. Doing so may warp it or cause it to crack. In the end, wood and plastic boards can be used to prepare meat or vegetables. It all comes down to maintenance and cleanliness. A plastic board that is full of dents should be thrown out and wood boards should be regularly treated. In lieu of sanitising plastic chopping boards in the dishwasher, pour boiling water over their surface.